Yin Yang is the concept of duality forming a whole. You can't have day without night and, similarly, you can't have good without bad. Balance is achieved when these competing interests are placed together. 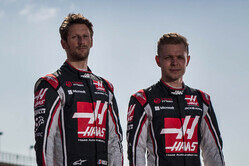 Haas F1 Team comes into the Chinese Grand Prix April 9 at Shanghai International Circuit seeking balance. After both its drivers failed to finish the season-opening Australian Grand Prix in Melbourne, the yang of a double DNF (Did Not Finish) in the first round of the 2017 FIA Formula One World Championship needs to be offset with the yin of a points-paying performance in Shanghai. Drivers Romain Grosjean and Kevin Magnussen are emphatic such a result is possible. Their disappointment in Australia was neutralized by the speed and potential of the Haas VF-17. The second-generation racecar built by Haas F1 Team was quick enough to be at the top of the midfield behind only the sport's giants - Scuderia Ferrari, Mercedes and Red Bull. Proof was Grosjean's sixth-place qualifying effort, which placed him ahead of Williams, Toro Rosso, Force India, Renault, McLaren and Sauber. It was also the best qualifying performance in Haas F1 Team's history, with the American outfit having made its debut in last year's Australian Grand Prix. Grosjean was unable to capitalize on the stellar qualifying effort, as a water leak ended his race after only 13 laps. Magnussen, meanwhile, also felt the speed of the Haas VF-17, but in trying to wring the most out of the Ferrari-powered machine, he went wide at turn 12 during his qualifying runs, shackling himself with a 17th-place starting spot. Deep in the field and jockeying for position on the opening lap, contact with the Sauber of Marcus Ericsson sent Magnussen into the turn-three gravel trap. Magnussen powered through the gravel and eventually returned to the track, but well down the running order. Then 11 laps short of the finish, a right-front tire puncture forced Magnussen to retire his racecar. With the racecar proving to be the yin of their Australian Grand Prix, Grosjean and Magnussen rightly carry optimism and experience into China. Grosjean has five career Formula One starts at the 5.451-kilometer (3.387-mile), 16-turn circuit. Three times he has finished in the points, with his best result being a sixth-place drive in 2012. Magnussen has two starts at Shanghai, with a top finish of 13th in 2014. Achieving points in China will involve continuing the pace set in Australia while solving the conundrum presented by Shanghai's "snail corners" and its massive backstraight. The snail corners both look like a snail and force drivers to take a snail's pace around them - at least by Formula One standards. These corners, which comprise turns 1-4 and turns 11-13, are juxtaposed with the 1.4-kilometer (.869 of a mile) backstraight - the longest in Formula One. There, drivers eclipse 320 kph (200 mph) before heavy braking into the turn-14 hairpin. Securing the downforce needed to maximize these vastly divergent elements, along with the other in-between aspects of the track, is akin to balancing on a razor blade. It's a track that features plenty of yin yang characteristics. Balance is key, and it's why Haas F1 Team is taking a balanced approach to the second race of its sophomore season. Even though the outcome of the Australian Grand Prix produced a double DNF, the weekend as a whole seemed to go well at least in regard to the speed of the car. Are you cautiously optimistic that you have a car capable of fighting at the top of the midfield? Guenther Steiner: "We are cautiously optimistic. We need to still prove that our performance wasn't a one-off. It's very tight in the midfield. On a good day, you could be on top, but on a bad day, you could be at the back. The other midfield teams have shown that this can happen. I think we surprised a little bit with our performance, especially Romain qualifying sixth with his lap, which was four-tenths faster than (Felipe) Massa's. That's pretty good." You were not alone in suffering a DNF at Australia, as five other teams had drivers who failed to finish. Reliability is important and it will come as the year progresses and more is learned about the racecar, but at this stage of the season, will you take speed and potential over reliability? GS: "Absolutely. If you've got speed, you can get reliability. It's not good not to have it in the beginning, but not to have speed would be much more difficult to fix than the reliability." Haas F1 Team impressed everyone last year with a sixth-place finish in its debut at the Australian Grand Prix. How important was Grosjean's sixth-place qualifying effort this year in dispelling any notions that Haas F1 Team's way of doing things wasn't sustainable? GS: "There will always be doubters. We'll always be told that next year will be more difficult, and then we have to prove it again. You have to prove yourself every year in Formula One. Again, qualifying sixth in the first race of 2017 quieted our critics a little bit. They will come back, but we proved we didn't just get lucky last year." Grosjean's sixth-place qualifying effort came as a surprise to many in the paddock, as there were questions about how Haas F1 Team would fare in its second year after it had to simultaneously race its 2016 car and develop its 2017 car. Did the qualifying performance surprise you? GS: "I would say yes. We were hoping to get into Q3, but we weren't sure because it's so tight in the midfield. Then to be sixth, with this distance to our next competitor, four-tenths, it surprised us. Obviously, we need to keep it up, or we need to try to do it again, to prove that this is where we should be. It will be difficult to keep that pace, or that distance, or even get into Q3 all the time because it's very competitive." Ferrari won at Australia, and Haas F1 Team runs the same Ferrari engine as the version that carried Sebastian Vettel to victory. Can you talk about the gains made by Ferrari with its 062 engine and what it means for Haas F1 Team? GS: "With the engine, there is not just one area that is better, it's the whole package that has improved from last year. It's now as competitive as a Mercedes engine, if not better. Ferrari won in Australia, but everybody is developing and trying to get better. It's always going to be a development race. They've made a good step, and without that help from Ferrari, we wouldn't be where we are." The engine has improved, but so has the car, and it was again built in collaboration with Dallara. How has Dallara incorporated what it learned from last year's car into this year's car? GS: "We just did what everybody does, but I think we made a bigger step. For us and Dallara, modern F1 was new last year. We made some mistakes and we were a little bit conservative on some parts, but we learned quickly. We've done a lot of things better than last year. What came out is a car which seems to be competitive." There was a lot of talk about the start of this year's Australian Grand Prix, specifically, how it would go since drivers need to release the clutch based on feel instead of with a program supplied by the team's engineers. Can you explain what drivers need to do to release the clutch this year compared to what they had to do last year and why it's so challenging? GS: "Last year, the engineers set the clutch bite point and it was a procedure. If you followed the procedure correctly, and if the mapping was right, everybody should've had a good start. This year, the engineers cannot interfere with the clutch. The drivers are on their own. Like anybody starting off at a set of traffic lights, with the clutch you need to make sure that your tires don't spin and that you don't stall. The F1 car, the clutch is on a paddle on the steering wheel, and also you cannot stall because there's an anti-stall device, but you lose a lot of time if that engages. It's just more for the driver now to get the right feeling and to handle it manually, and also mentally. It's a big stress knowing that you're in control of it and not an electronic set of data." China marks the first stint of back-to-back races, as Bahrain is the very next weekend. Considering that China and Bahrain are both flyaway races, how difficult are the logistics of moving a team across an ocean when you only have two days to pack up from one venue and arrive at another? GS: "It is very challenging. Some of our freight back to the U.K. to rebuild parts was delayed, so that didn't help. Instead of having three days to rebuild stuff, we just had one. Otherwise, it's very well organized from Formula One Management how this stuff travels. People are used to it, but it is challenging. You need to be well organized and all F1 teams are highly organized operations. We are prepared for it. People work hard day and night. With something like the freight coming in late, you need to rewrite your plans. You need to give the guys a few days off before the freight comes so they can work those last days before jumping on the plane and going again." Explain the level of sophistication with today's Formula One car. Why can't a problem be fixed in the garage during the race in the same manner a problem with a NASCAR Cup Series car can be fixed during the race? GS: "If something breaks in a Formula One car, they are so highly sophisticated that it's quite a process to determine all that's wrong and then, normally, there's not enough time to fix it. Plus, your mechanics are involved in all the pit stops, so when something goes wrong, you can't pull three or four guys to fix an issue because, by regulation, they're needed for the pit stop with the other car that's still running on the racetrack. To try to fix the car just to come in last, 20 laps down, doesn't make any sense." Even though the outcome of the Australian Grand Prix produced a DNF, the race weekend as a whole seemed to go well, which was best exemplified by your sixth-place qualifying effort. How is the Haas VF-17 to drive and what makes you so optimistic going into the Chinese Grand Prix? Romain Grosjean: "The car felt good to drive from the first lap. We made some setup changes and things reacted pretty well, so that was very positive from the weekend. I felt comfortable all weekend long in the car. Qualifying was, of course, a good moment with the new tires and the new cars running on full power with an empty tank, everyone just going for it. It was pretty exciting in that aspect. I was very pleased with how the car was. Even on high fuel in the race the car felt good. It's a shame we did not finish the race, but things are good and we keep our fingers crossed that she'll be as good in China as she was in Australia." You were not alone in suffering a DNF at Australia, as six other drivers failed to finish. Reliability is important and it will come as the year progresses and more is learned about the racecar, but at this stage of the season, will you take speed and potential over reliability? RG: "It's always good to have a fast car, one that's maybe not 100 percent reliable, over a slow car that is reliable. I wouldn't have much fun finishing the grand prix in 15th, but if I'm always fighting in the top-10 and having some good results, sometimes having an issue at the beginning of the year is not a huge deal. We've got the performance, which is what we want. Of course, it's not ideal not to finish the race - that's not what we want. But again, if the car is fast, we can aim for some good points and the reliability is something we know we can fix." In five career Formula One races at the Shanghai International Circuit, you've had three point-paying finishes and all of them came from a top-10 starting spot. It shows how important qualifying is, but it also seems to showcase your talents. Is there something about Shanghai that plays to your strengths? RG: "No. Shanghai is a tricky track because it's very different from the early stages in the year. It's a front-limited circuit, meaning that the car needs to work well with front tires. If it doesn't, then it gets very tricky. Overtaking in Shanghai is not impossible. There's the long backstraight with DRS helping overtaking maneuvers. In general, if the car is good in qualifying, the race should be quite good. If not, then in the race you're going to struggle. If you qualify in the top-10, you should finish in the top-10. If you're not, then it's harder." There was a lot of talk about the start of this year's season-opening Australian Grand Prix, specifically, how it would go since drivers need to release the clutch based on feel instead of with a program supplied by the team's engineers. How did it go? Is getting it right akin to balancing on a razor blade? RG: "It's not easy. Starts are complicated. There are a lot of equations taken into account. It's pretty tricky to know exactly what to do. We're not yet the best, but we're going to keep working hard on it. We have some room for improvement. Race starts this year are going to be tricky. I was actually surprised there weren't any big dramas at the start of the Australian Grand Prix. It may happen in the year." Can you explain how you released the clutch last year and what you have to do this year to get a proper start and why it's so challenging? RG: "Last year, you could shape the clutch map to the clutch. They were a bit rigid where you could drop the clutch - there was a big range on the drop. This year, we have to be leaner. If your travel is 10 centimeter, generally you release one centimeter - that's 10 percent of the clutch. There's not a place where you can play with a flat map. Therefore, you drop it in a good region, and you have to drop it in a perfect percentage for the grip of the track." What does it feel like to nail a start? RG: "You know the engine revs have dropped down to a good place, you feel like you can go on power, and it all just goes to the track and the car is moving forward pretty quickly. It normally happens in the first, I would say, 30 meters. You know then if you've nailed it or if it's just going to be a difficult start. From there you can react. You can overtake the car in front of you or you just protect your position and make a bit of queue." What can happen if you botch the start, other than losing positions? Stalling the car? Inducing so much wheelspin you spin out? RG: "If you get a lot of wheelspin, you just stay on your position, which is not great. If you drop the clutch too quickly, then you'll get the anti-stall, so the car won't actually stall, but when that happens you need to pull the clutch back and release it again. Normally, you're pretty stressed, so you release it too quickly again the second time and you get the second anti-stall. It's a bad way to start." Starts have always been important, but are they even more so this year since the car's aerodynamic advances have made them so fast and their wake so turbulent that it's even more difficult to pass? RG: "Some races this year, qualifying and the start will be the key. Take Monaco, there's no way you're going to overtake there. Race starts and qualifying will be very important. Some other races, maybe China, Bahrain and Russia, you may actually see some good fights out on track. It's always going to be important, but not as much as at some other venues." When you're in the wake of another car, what happens to your car as opposed to when it's in clean air? RG: "When you follow another car, you lose downforce. It's basically like you've got smaller wings or just less grip on the car. Therefore, it's harder to get closer. The closer you are to the car in front, the worse the effect is." What is your favorite part of the Shanghai International Circuit and why? RG: "I love turn one, just because it's a challenge going flat-out into the corner, then downshifting into second to finish up. It's a pretty cool corner." Is there a specific portion of the Shanghai International Circuit that is more challenging than other aspects of the track? RG: "Turn one is a pretty challenging part. It's such a long corner, you can actually make some difference. Then being up on the backstraight, that long right-hand side corner, going onto the throttle, as well, is important because you've got one-and-a-half kilometer of straight line. You need to be as early as possible on the power." Even though the outcome of the Australian Grand Prix produced a DNF, you appeared comfortable with the car and happy with its pace. How is the Haas VF-17 to drive and what makes you so optimistic going into the Chinese Grand Prix? Kevin Magnussen "It's really good news that the car is as competitive as we had hoped for. There's obviously no guarantee it's going to be as competitive again. We need to work hard to get the most out of it and make it competitive again in China. The car was there, it was performing, it was just on my side I had a bit of a tough weekend. I didn't get enough track time and there were too many issues with reliability that meant I didn't have a good weekend. It's positive, though, that the car is competitive." KM: "Yes, I think so. The most important thing is to finish the race, otherwise you get nothing out of anything. It's still very encouraging when you see the car is fast. I'd rather have to sort out reliability than sort out an underperforming car. Performance-wise, it's there. We just need to make it run." KM: "There wasn't much difference with people getting it wrong or getting it right. Most people made a decent start. That was a bit surprising. I thought more people would get it wrong. It's different, but it's not really too bad. It's made it a little bit more variable, but not too much. It's still doable." KM: "Last year, you just had to release the clutch pedal to about halfway. It didn't really matter if it was spot-on as long as you were sort of past 10 percent and under 90 percent - you were somewhere in that middle zone of where the clutch was performing. All you had to do was react quickly." KM: "The most important thing is to be at the limit of the grip of the rear tires, not to go past it. If you go past it, you get wheelspin. You'll have a little bit of wheelspin initially, but then you need to catch that, and make sure you go just on the limit of wheelspin." KM: "It's more that you just lose positions, which is annoying." KM: "I think some tracks are going to be easy enough to overtake. Melbourne has always been really tricky to overtake. It was perhaps even trickier than normal. Some other tracks are going to be easier than last year because our straight-line speed is a bit lower, there's more drag, so the DRS is going to have a big effect, which means overtaking is going to be easier. In China, for example, and Bahrain, it'll be interesting to see how it works out there, because I think it should still be possible to overtake." KM: "You lose a lot of grip. The downforce is obviously disturbed by the turbulence from the car running in front. The closer you get, the bigger the turbulence is from that car. You get more disturbance in the aerodynamics and you lose grip." KM: "I'd say turn one is pretty good fun. It's a very unique corner where you turn in at very high speed and you end up at very low speed. It's an incredibly long corner and pretty unique for that. The rest of the track is pretty straightforward." KM: "I would say turn one is the only non-traditional element, the rest, as I said is pretty straightforward."